Bold, white, daisy-like flowers with drooping petals that reveal burnished, orange-brown centres appear of stiff stems from June to September. 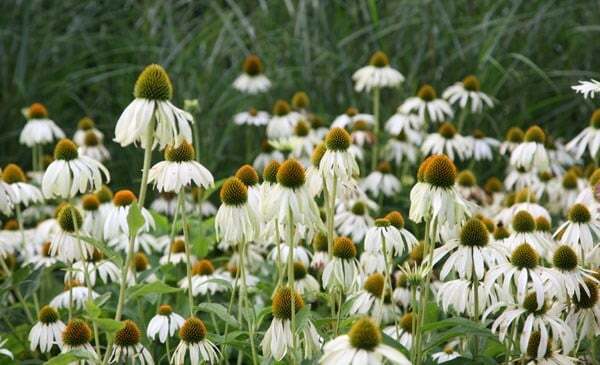 This white coneflower is shorter than many other varieties, making it a valuable addition to the middle of a border. 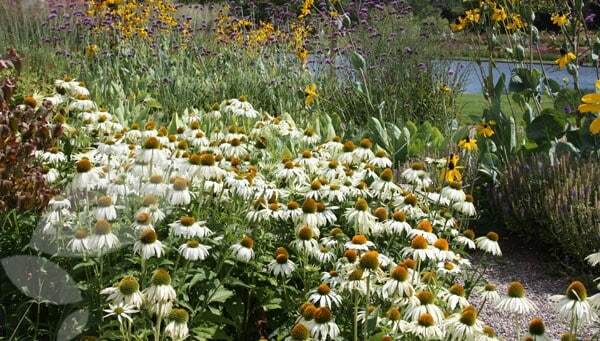 It is a tough plant, and, like other coneflowers, is long-flowering and will cope well with adverse weather conditions, except drought. Try it dotted through the middle of a sunny, mixed border or in bold drifts among grasses where it will extend the season of interest. It is attractive to bees and butterflies, and birds will flock to the seedheads. Planted these in clusters behind lavender for height and colour, look great, healthy week packed and delivered plants. A beautiful addition to a sunny border but takes a few years to get established so needs to be cared for and protected from slugs and snails. A lovely addition to my garden. This Echinacea 'White Swan'was a lovely addition to my garden. It flowered a little during its first Summer here in Scotland. Ihave given four stars as due to this years hard Winter I have no idea if it has survived having been under snow for several days in February.Hopefully it will re-appear soon! I have purchased numerous items from Crocus over many years. The quality never fails. You get what it says on the label from Crocus. Better than any nursery I have used. The quality of the packaging and delivery superb. The best thing with Crocus plants is that you can see them in gardens at RHS Chelsea and when ordered you can get the same effect in your own garden. Wonderful!